Mark your Calendars! Alhambrans Against the 710 Tunnel need your help! We are planning to meet starting at 5pm by the Alhambra arch / rose garden at the corner of Valley and Fremont. Please show up when you can. You will be able to find us. Please wear your No 710 T-shirts, buttons, or at the very least a red t-shirt. For parking, Consider parking at Kohl's at Mission and Fremont. Or take Marengo down to Valley and find parking at CVS on Fremont and Valley. Carpooling and other forms of transport are highly encouraged. Last year, the city provided blue t-shirts for all city employees who then attended during working hours. Until this month, the 710 Freeway connection battle was a zero-sum game. 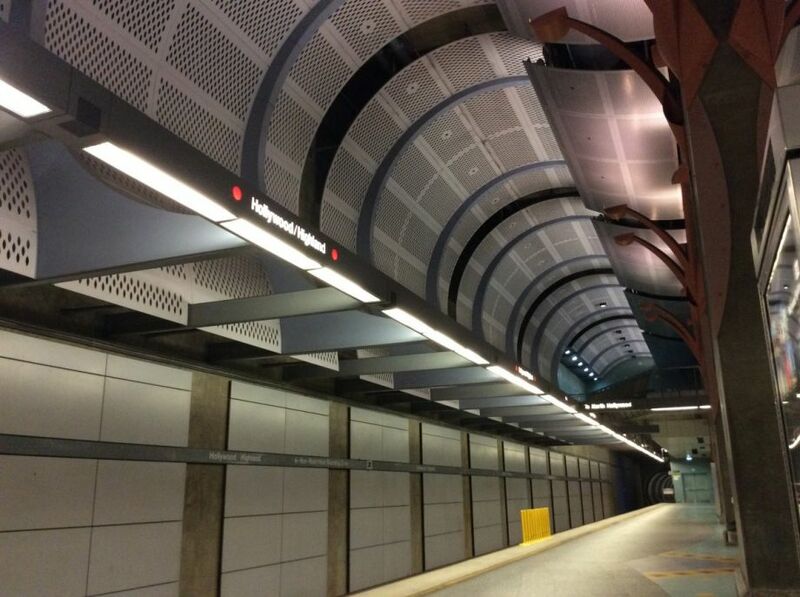 San Marino and Alhambra are pro-tunnel to reduce local traffic. LCF, South Pasadena and Pasadena are anti-tunnel. Zero-sum means there are only two options. Either you win or you lose. If San Marino wins, La Cañada loses. If South Pasadena wins, then Alhambra loses. If you live in Pasadena, you know the connection is a bad idea. The proposed tunnels require giant vents that would spew exhaust into Old Town Pasadena. The geologic component of the draft environmental impact report is dubious. There could be subsidence. There could be sinkholes. If you live in LCF, you know the connection is a bad idea. There would be increased truck traffic on the 210 Freeway. Historically, one accident shuts down the 210 and Foothill Boulevard. If you are Caltrans, your job is to build freeways. Caltrans runs heavy equipment all night long under the 2 Freeway, by Goldstein's Bagels, Starbucks and Café Sole. LCF construction hours? They don't seem to apply to Caltrans. Count on Caltrans to push the tunnel. But if you are Rep. Adam Schiff, you are a child of the future. Rep. Schiff and a group called Beyond the 710 (beyondthe710.org) have proposed an elegant solution that will reduce the congestion in Alhambra and San Marino without connecting the 710 Freeway. Under the group's plan, everyone can win. Beyond the 710 notes that over 85% of the cars exiting the 710 Freeway at Valley Boulevard are headed to local destinations, and that well-planned transit lines could reduce that traffic, at a fraction of the cost of the tunnels. “Beyond the 710 believes that the proposed 710 Tunnel would not only devastate communities, it would be a massive waste of money that could be much better spent on different projects... Caltrans' and Metro's own studies show that the billions of dollars would not appreciably improve anyone's commute, and would further add congestion on already overloaded freeways,” Beyond the 710 says on its site. We change our cellphones every two years, why do we depend on 1960s' transit plans? That's why state-of-the-art traffic synchronization, well-planned bus service, enhanced light rail and better use of existing freight networks will reduce traffic and avoid the tunnels. Freight traffic is a key component. We see way too much freight traffic on the 210 Freeway through LCF as things are now. The 20-mile long Alameda Corridor is an underused dedicated freight rail expressway, parallel to Alameda Boulevard, that was designed to connect the ports of Los Angeles and Long Beach to the interstate rail system in downtown Los Angeles. The Alameda Corridor is underused. Why use container trucks when there are container trains? Enhancement of the Alameda Corridor connection would reduce the number of big rig/container trucks on all of the freeways, including the 210, and free up real estate for parks, bike lanes, houses and public use. Will we use outmoded technology and analysis? Or will we embrace the 21st century and find a win-win solution? A coalition of community organizations and cities gathered at Metro headquarters last week to publicly oppose to the construction of a tunnel connecting freeways between Alhambra and South Pasadena and to present what they said is a new direction in the SR-710 debate. “Today is a new day in the 710 debate,” said Glendale Mayor Ara Najarian, a firm opponent to the building of a tunnel to close the gap between the terminus of the 710 Freeway in Alhambra and the 210 Freeway in Pasadena. 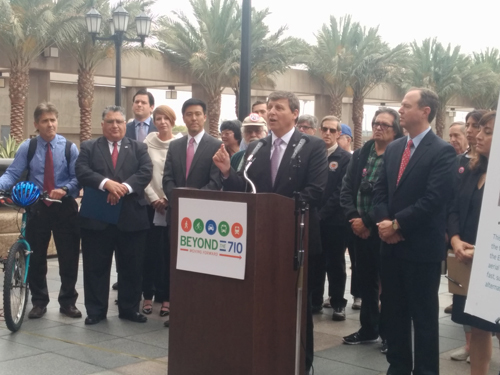 “We are committed to finding solutions that work for everyone,” Najarian said during the May 28 press conference to announce the Beyond the 710 Plan, a new initiative backers say will do a better job of reducing traffic and connecting people than the current options under review for the 710 Freeway. The cities of Glendale, La Canada Flintridge, Pasadena, Sierra Madre and South Pasadena have all signed onto the coalition and support its plan for expanding public transportation and building more pedestrian- and bike-friendly paths to reduce traffic congestion in the western San Gabriel Valley. “There’s a lot of money at stake here,” said Najarian, referring to the $5.6 billion it would cost to build the tunnel, one of five alternatives currently under review. Najarian is also a member of the Metro Board and said last week that the 710 Freeway tunnel is favored by engineers, contractors and developers because they stand to make a lot of money. The closing of the 4.5 miles gap between where the 710 ends in Alhambra and the 210 Foothill Freeway in Pasadena has been under debate for nearly six decades. In March, Metro released a Draft Impact Report/Environmental Impact Statement (DIR/EIS) that contains five proposed alternatives for improving traffic through the region; a freeway tunnel, a light rail train; a rapid bus line; a traffic management system and the required “no build” option. Several public hearings on the draft report have already taken place in cities and neighborhoods that would be the most impacted by the project: The tunnel and light rail line alternatives have by far generated the most support and opposition. Backers of the new Beyond the 710 initiative said last week that Metro initially had more than 100 proposals to choose from and that none of the five alternatives in the Draft Impact Report would be as cost effective or good for the community as what they are proposing. The group presented its plan to the Metro Board, which is in the process of evaluating the alternatives for closing the 710 gap but did not comment on the Coalition’s plan to expand bus service and build a network of surface street projects, including a four-lane roadway – Golden State Boulevard – that would travel from the south stub of the 710 freeway to Cal State LA, connecting along the way to Freemont Street, Alhambra Avenue and Mission Boulevard. They claim the surface street network will make using public transportation easier by connecting both legs of the Metro Gold Line, the Green and Blue Lines, as well as Metrolink’s San Bernardino, Riverside and Orange County lines and the El Monte busway. The Coalition said there would be stops on or near Huntington Hospital, Cal State LA, East LA College, St Francis Medical Center and the communities of Bell, Maywood and South Gate. The plan also proposes restoring the Arroyo Rosa de Castilla, a year-round creek that runs alongside and under the 710. Restoration would provide over 30 acres of new parklands, three regular soccer fields, and a 2.5-mile bike path connecting Alhambra, El Sereno and South Pasadena. Planners for the project estimate the cost at $875 million. Claiming it would cause significant damage to their cities, the group said building a tunnel is completely unacceptable. “Pasadena has suffered the negative impacts of freeway ‘solutions’ and we recognize that better options exist, such as great streets and smart transit,” said City Manager Michael Beck. On the other side of the issue, the 710 Coalition — which includes several cities and communities along the 710 freeway that favor the tunnel alternative — released a statement criticizing the new initiative as too late in the game. Tunnel opponents have “rebranded themselves” in an effort to undermine Metro’s ongoing DEIR/EIS process, which took four years to be reviewed, processed and released, they said. City officials, businesses, labor and local residents have been engaged in the ongoing public comment process since March 6, the 710 Coalition pointed out. “To disrupt this process is unconscionable and disrespectful to the hundreds of residents that have participated in the process throughout the years,” said Alhambra Councilmember Barbara Messina. Metro and Caltrans have spent countless hours and millions of dollars to support the review and analysis of the five alternatives to address the incomplete 710 Freeway, the statement said.